A talented artist and metalsmith, Roy Bellows has a unique ability to create objects and structures that reflect the essential nature of places and ideas. His artistic expression can be found in the distinctive entry gates, building signs and metal accents that grace the St. Stephen’s campus. That these pieces fit so seamlessly into the school environment and feel like such an authentic extension of the school itself is no accident, but rather a matter of careful consideration and design. “Metal work is concerned with both form and function,” Bellows explained. “It is very practical, while also being a means of artistic expression. Sign making is largely about making shapes work together; the spacing between the letters and the type of font used are very important. “Signs tell who we are, who we were and when we existed,” he continued. “They are important because they represent us, they express our values, and they commemorate our place and time in the world. What is more real than our name and our dates?" In designing the signs that mark the school’s entrance and academic buildings, Bellows used a classic Roman font made of hand-forged letters placed in a natural limestone setting. 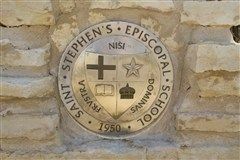 This combination of formal and natural elements, as well as the use of stone and steel, perfectly reflects the ethos of St. Stephen’s.